Mailing it in today. Hang tight. Toskala vs. Thomas tonight. Thomas couldn't keep it out in the battle vs. Lundqvist, but hopefully will fare better against Vesa. In case you hadn't heard, stud defenseman Andrew Ference is out 6-8 weeks with a Broken Tibia. This is a much bigger deal than it seems at first. 6 d-men are on the road trip. C'mon, Hunwick. Maybe Lashoff? One way or another, this gives him enough time to record another greeting for the MBTA like we had at the end of last year. Maybe a commercial? The Bruins haven't lost in regulation yet this month. (5-0-1) Let's not cough another one up to the Leafs. Our first game of the year in Toronto. We're 1-1 against them so far at the Gahden. Holy crap, Robert Mueller is a beast. Makes Phil Kessel look like a wuss for missing 11 whole games with cancer. TSN has upgraded the B's to second in the power rankings. HubHockey: Solid preview as usual. Stanley Cup of Chowder: Lists Bruins coaches that haven't made it as far as Julien. WickedBruinsFan: Claude Julien will be behind the Boston bench, coaching his 100th Bruins game tonight. 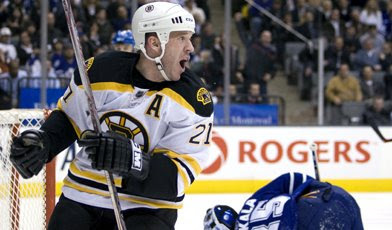 It would be nice for the Bruins to give him a win. NESN.com first shift: "There’s no time to rest or recover. The Bruins have a target on their back. With four games in six days -- including three contests against division foes -- the Black and Gold need to battle to hold onto first place in the Northeast, starting against a pesky Leafs team. Nobody said being the best would be easy." Who writes this stuff? The Bear Cave: Points out the Toskala got pulled on Saturday.